Department of Pharmacognosy-Phytochemistry, Faculty of Pharmacy, Universitas Indonesia, Depok, 16424 West Java, INDONESIA. Department of Biomedical Computation, Faculty of Pharmacy, Universitas Indonesia, Depok – 16424 West Java, INDONESIA. Melinjo (Gnetum gnemon) seeds have been known to have some biological properties. One of them is ant hypercholesterolemia. The present study investigated in vitro and in silico methods to predict potential antihypercholesterolemic of the Melinjo seed extracts of through HMG-CoA reductase inhibitory activity. Melinjo seed powders were successively extracted by reflux method using five solvents with gradient polarity including: n-hexane, dichloromethane, ethyl acetate and methanol. All extracts were evaluated in vitro using HMG-CoA Reductase assay kit, to analyze the inhibitory activity. 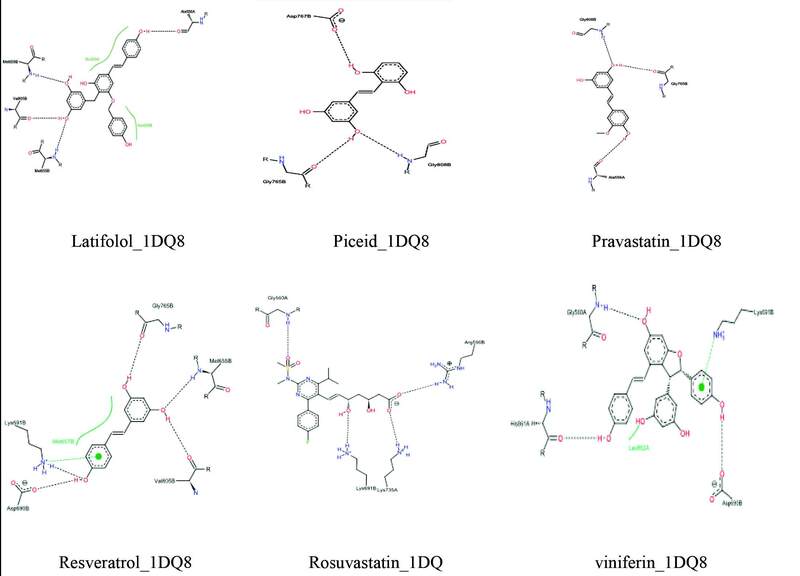 Molecular docking of the phytochemical content of the seeds were carried out using Auto Dock Vina, and also Ligand Scout to analyses interaction between ligand and receptor. Dichloromethane extract demonstrated the highest inhibitory activity against HMG-CoA reductase with IC50 value is 0.40 µg/mL, followed by that of ethyl acetate extract. UPLC-MS analyses showed that dichloromethane extract contained trans-resveratrol, piceid, gnetin C, gnetol, isorhapontigenin, ɛ-viniferin, gnemonol L, and gnemonol M. Molecular docking studies demonstrated that dimer of resveratrol such as gnemonol L, gnemosida, and ɛ-viniferin have better free binding energy than that of monomer. piceid, gnetin C, gnemonol L, and gnemonol M could be considered as HMG-CoA reductase inhibitor. Gnetum gnemon seed extract showed strong HMG-CoA reductase activity. Resveratrol dimer promises as a potential lead compound to design/synthesize anti-cholesterol. The Gnetaceae family is known to contain stilbenoid group including resveratrol, gnemonols A-L, gnemonosides K, and gnetin E. These compounds were also successfully isolated the stem and root of Gnetum gnemon L.9 While, melinjo seeds have been reported containing gnetin L, gnetin C, gnemonosides A, C, D, and resveratrol.4 This compound distributed in some species plant including Veratrum grandiflorum, Polygonum cuspidatum, Vitis vinifera and a wide variety of other food sources.10,11 Resveratrol has been believed to explain the lower incidence of myocardial incidence.12,13 Animal studies have showen that resveratrol could reduce the expression of HMG-CoA reductase mRNA.14 It has driven considerable interest towards resveratrol in Melinjo molecular activities. Molecular docking has been use to search and design new potential drug from natural products, such as flavonoid and alkaloid.15,16 Based on the biological activity of Melinjo seeds and its stilbene component, this study presented the HMG-CoA inhibitory activity and molecular docking of the stilbene to predict in silico HMG-CoA reductase inhibitory activity. Fresh Melinjo fruits were used in this study were purchased from a local market Jakarta, Indonesia. Seeds were physically separated from the hard-coat and dried. Dried seeds were then ground to a fine flour (mesh size 30) by using a blender. The powdered seed packed in air-tight polyethylene plastic jar and refrigerated at 4°C, prior to analysis. Dried melinjo seed powder was successively extracted using gradient solvents: n-hexane, dichloromethane, ethyl acetate, methanol, and distilled water. Crude extract obtained after removing solvent using rotary vacuum evaporator at 50°C (Buchi, Switzerland). While aqueous extract directly freezes dried with freeze dryer (ScanLaf, Denmark) into white powder. The HMG-CoA reductase inhibitory activity was performed on the extracts according to Zhou et al with slight modification, with pravastatin as the positive control.17 Briefly, a reaction system in vitro consist of NADPH (4 µl) and the substrate (HMG-CoA, 12 µl) was diluted with potassium phosphate buffer (100 mM, pH 7.4) containing KCl (120mM), EDTA (1mM) and 5 m DTT (5mM) until final volume 200 µl. Two µL HMG-CoA reductase (Sigma-Aldrich, Louis, USA was added to the reaction mixture as initiation time (time 0) and was incubated at 37˚C in the presence or absence of samples solution (1 µl). Resveratrol assay was performed on a Shimadzu HPLC LC-20AT, with UV detector, YMC C-18 column (150 x 4.6 mm I.D., 5µm), and temperature column 25°C. Water/acetonitrile (75/25) was adjusted to pH 3.00 as mobile phase with flow rate 1.0 mL/minute.10 Injection volume was set up at 20 µL, monitored at 306 for 15 minutes. 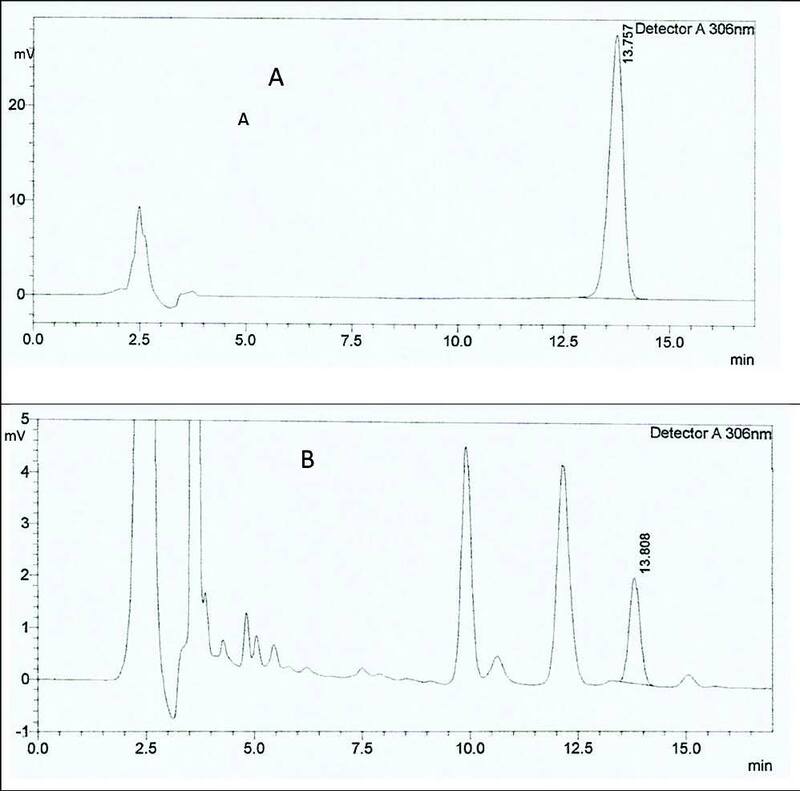 Liquid chromatographic separations were conducted on a Xevo G2 Acquity UPLC™ with BEH C18 column (50 mm × 2.1 mm, particle size=1.7 μm, Waters Corp, Milford, MA, USA). The column and autosampler tray temperature were maintained at 35 and 4 °C, respectively. The mobile phase consisting of water containing 0.1% formic acid (A) and acetonitrile containing 0.1% formic acid (B) was used at a flow rate 0.3 ml/min. The gradient elution was from 95% A to 0% A within 6 min and then held for 1 min. From 7 to 7.5 min, the percentage of A was increased to 95% and maintained about 1.5 min, then reduced to the initial condition within 1 min and balanced for 2 mins. The total running time was 10 min, and the sample injection volume was set at 5 μl. The UPLC system was connected to the mass spectrometer through an ESI interface and was operated in the positive ion detection mode. Nitrogen used for desolvation was 500 L/h, cone gas was set at 16 L/h. The capillary voltage was set at 3 kV, source temperature 110 °C, desolvation temperature 300°C. Data acquisition was processed with Masslynx 4.1 software. AutoDock4.2 was used for molecular docking studies calculation, using a Lamarckian genetic algorithm between flexible ligand and rigid receptor, a population size of 300, a maximum of 250000 generations and 2 500 000 evaluations for 100 GA runs. (20)(20) The root means square deviation tolerance was set to 2.0 Å for the clustering of docking results. Interaction ligand-receptor were processed using pharmacophore feature of LigandScout (Inte:Ligand, Vienna, Austria). 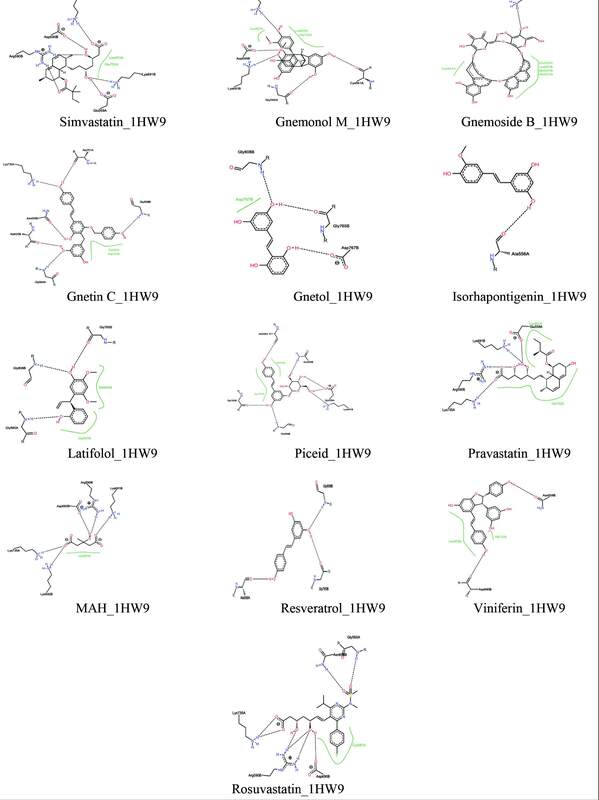 Visualization all ligand for hydrophobicity used program UCSF Chimera 1.10.2. Table 1 showed HMG-CoA reductase inhibitory activity of the extracts. Dichloromtehane extract demonstrated the best inhibition activity with 64.78% at 100 ppm, was followed by ethyl acetate extract with inhibition activity 57.86%. Further investigation, the IC50 of dichlormethane extract was 0.40 mg/ml. However, HMG-CoA reductase inhibitory activity of dichloromethane extract is lower than the trans-resveratrol. Resveratrol assay was determined by HPLC. Figure 1 shows the chromatogram of resveratrol and dichloromethane extract. Resveratrol content of each extract was presented in Table 2. Resveratrol was found in dichloromethane, methanol and ethyl acetate extracts. Dichloromethane extract contained the highest level of resveratrol, followed by methanolic extract. LC-MS chromatogram showed that extract contains seven prominent peaks with molecular weight 227, 262.29, 280.296, 395.361, 455.195, 537.331, 617.203, and 779.248 au (Figure 2). Some peaks suggested to originate from the stilbene contained in Melinjo seeds, such as: gnemonoside B (m/z-779.248) and gnetin C (m/z-455.195). 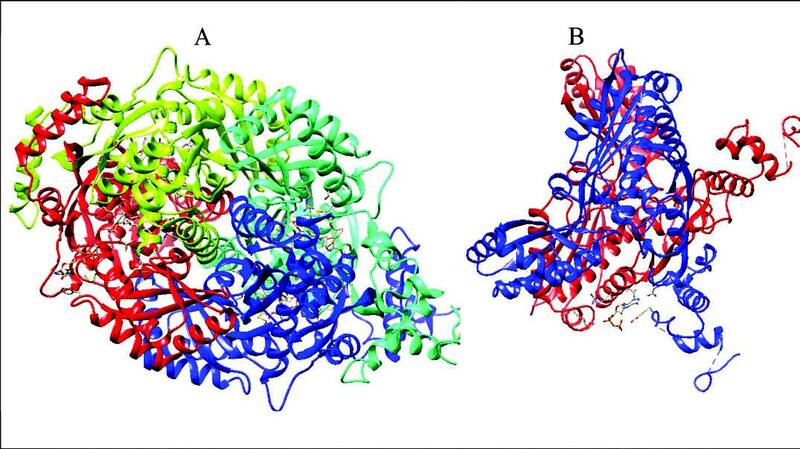 HMG-CoA Reductase appears as a tetrameric protein complex, structure of enzyme is shown on image below (Fig 3A and 3B). Due to efficiency of time, docking procedure was conducted using dimeric structure of enzyme complex. The validation was carried to assure the accuracy and precision of the used method. HMG-CoA Reductase enzyme complex [PDB ID 1HW9] and [PDB ID 1DQ8] were downloaded from protein data bank and redocked against their original ligand. MAH as the original ligand of 1DQ8 gave free binding energy value -7.19 kcal/mol and RMSD value 1.12 Å. HMG-CoA Reductase complex with simvastatin gave free energy binding value as high as -9.76 kcal/mol and RMSD as high as 1.45 Å. Obtained RMSD value of redocked MAH and simvastatin are lower than 2.00 Å. Therefore, the docking method is valid to dock several compounds of dichlormethane melinjo seed extract. Table 3 shows free binding energy of docked stilbenes in Melinjo seed with their ligand. [i] *The values are average from the triplicate experiments. Sample concentrations are 100ppm. [i] *The values are average from the triplicate experiments. Resveratrol as standard was quantified to obtain calibration curve and regression equation. Linearity R-value and regression equation were 0.9998 and Y=106945X-229881. Retention time of resveratrol observed under 306-320 nm wavelength was given a maximum peak at 7 minutes (Figure 2). Sample solutions were observed in the same way of standard. Each peak in chromatogram was identified by comparing the retention time and UV spectra of the samples with that standard. Quantitation was carried out by standard external. Peak’s area, then, plotted into regression equation. Resveratrol was present on three samples include ethyl acetate extract, dichloromethane, and methanol extract, with a result of 8.190, 3.184, and 686 mg/kg, respectively (Table 4). Meanwhile, n-hexane and aqueous extract gave a non-significant result on HPLC separation and UV detection. The retention time of samples was similar to resveratrol after 7 minutes. UV spectra also compared with a previous study,10 which displayed a split peak, shown in Figure 1. 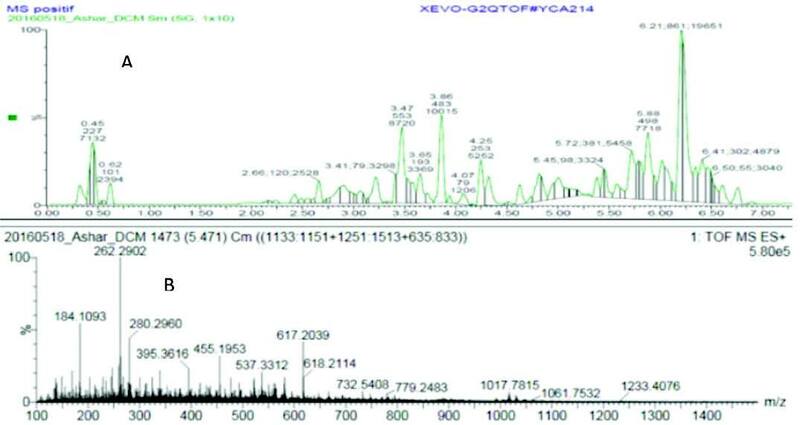 LC-MS chromatogram exhibited that extract contains seven prominent peaks with molecular weight 227, 262.29, 280.296, 395.361, 455.195, 537.331, 617.203, and 779.248 au. In the other hand, there are several small peaks which may have also contributed to enhance the activity. Cho et al. (2008) reported that resveratrol (m/z-229.0625) is responsible for its attenuation against the expression of HMG-CoA reductase mRNA in hamsters.14 Kato et al. (2009) also reported some chemical constituents from Melinjo seed extract such as gnemonoside B (m/z-779.24); gnetin C (m/z-455.14); and resveratrol (m/z-229.0625) are responsible for antioxidant, antimicrobial, and other pharmacological properties.4 Whereas in present study distinct peaks of molecular weights (m/z-227au) was very similar to resveratrol; (m/z 779.248) was similar to gnemonoside B; and (m/z-455.19) was similar to gnetin C.
The results of in vitro test demonstrated that each extract of melinjo seeds have the capability to inhibit activity of HMG-CoA reductase. Dichloromethane and ethyl acetate showed the strongest HMG-CoA reductase inhibitory activity. Dichloromethane extract demonstrated significantly inhibition activity of HMG-CoA reductase and exhibited concentration dependent manner with inhibition activity on the enzyme. Additionally, resveratrol (standard) was tested and the IC50 value was determined. Results of docking were analyzed and the best-docked confirmation was chosen based on their number of conformations in a cluster and the lowest free energy binding. Higher numbers of conformations and the lowest binding energy indicated better affinity of the compound to be docked into HMG-CoA reductase enzyme with PDB ID 1DQ8, 1HW9. As shown in Table 3, external compounds, piceid, gnetin C, gnemonol L, gnemonol M, viniferin and latifolol docked better and results lower free energy binding than the original ligand MAH in the HMG-CoA reductase enzyme [PDB 1DQ8]. Gnetin C, gnemonoside B, gnemonol M and gnemonol L, docked better than the ligand SIM4 (simvastatin) with PDB 1HW9 and ligand pravastatin as reference drug. Compounds in Melinjo seed perform contacts with LEU853, LEU857, and LEU862, which these amino acids are the most important residues for hydrophobic interaction. There are several amino acid seed those give similarity with statin drug (Pravastatin) and MAH as the original ligand of HMG-CoA Reductase: LYS691, ASN658, MET657, MET655 with PDB 1DQ8; amino acid LYS691, LEU853, GLU559, LYS735, HIS752, LEU857, ASP690 with PDB 1HW9 (Figure 4, 5 and 6). These results indicate that the interaction of piceid, gnetin C, gnemonol L with HMG-CoA reductase (PDB ID 1DQ8 and 1HW9) residues might lead another way to develop novel HMG-CoA reductase inhibitor. Further study was needed to evaluate anti-hypercholesterolemia activity of the extract and stilbenoid from the seed of this plant through preclinical and clinical studies. In addition, safety study was needed to guarantee the use of the extract. Based on the results of the study, it was concluded that melinjo seed dichloromethane extract not only able to hinder the enzymatic activity of HMG-CoA reductase, but also is potentially prohibit with MAH substrate against HMG-CoA Reductase receptor, which might suggest its role in treatment of hypercholesterolemia. This study was funded by Grant of PITTA 2016 provided by the Directorate of Research and Community Enggagement, Universities Indonesia. Conflicts of interest CONFLICT OF INTEREST There is no conflict of interest.